A book blogger walks into a library . . .
introduced me to Nashville author Jessica Young. 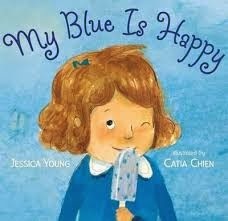 (illustrated by Catia Chien, published by Candlewick). Mother’s blue was sad, but the narrator’s blue was happy. Mother liked yellow, but the narrator did not. I don’t know about red. The narrator’s friend’s favorite color was pink, but the narrator did not like it. Dad thought brown was ordinary, but the narrator thought brown was special. I don’t know about green. I don’t know about orange, either. Nor do I know about gray. Not even black. But I loved that the book had colors in it.